2 LIGHT monsters, including a monster with 2000 or more ATK. If this card is Link Summoned: You can target 1 “Photon” or “Galaxy” monster in your GY; add it to your hand. During your opponent’s Main Phase (Quick Effect): You can discard 1 “Photon” and 1 “Galaxy” card, OR discard 1 “Galaxy-Eyes Photon Dragon”, then target 1 Special Summoned monster your opponent controls; destroy it. You can only use each effect of “Galaxy-Eyes Solflare Dragon” once per turn. Galaxy-Eyes Solflare Dragon ends the week and the month. This Link 2 Light Dragon-type Link Monster has 2000 Atk and arrows pointing diagonally downward. Not very difficult to properly summon requiring any 2 Light monsters, one having to have 2000 or more attack. I’m glad it didn’t say original attack so something getting a boost would work as well. 2000 Atk makes sense here, but a little more Atk would have been nice. After Link Summoning GESD, you can target a Galaxy or Photon monster from your grave to add to your hand. Replenishing resources is good during any phase of play. As a secondary effect during your opponent’s turn, you can ditch a Galaxy and Photon card from your hand to target and destroy an opponent’s Special Summoned monster. However you also get to use the original GEPD as cost for that effect instead of the 2 cards. I like that you have the option, and I like that it says card and not monsters. Both effects are once per turn, but if there is ever a way to Link Summon during the opponent’s turn, both effects could be used. I wish the destruction effect didn’t target, but Galaxy-Eyes Solfare Dragon is a beautiful and useful card for the archetype and to end the week. Happy Friday! It is no surprise in this archetype that Galaxy-Eyes Solflare Dragon is a disruption card. Corner arrows are always appreciated in a Link Monster. Two LIGHT monsters with at least one being 2000 or more ATK, easy in this archetype, and easy in many LIGHT-based decks. Resource recoup of one upon Link Summon, that is helpful with its next effect. Destruction ability of a Special Summoned monster during your opponents turn forces your opponent to play around the Solflare Dragon. With priority gone their big monsters won’t get their effects off before this monster can wipe them off the field. 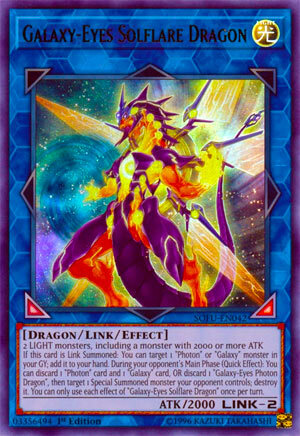 At the cost of a Photon card and a Galaxy card, or one “Galaxy-Eyes Photon Dragon”. While discarding two to destroy a Special Summoned monster can seem like a steep cost, Galaxy and Photon monsters can get their monsters and cards back through effects, and with Galaxy Trance, at least one of those cards can be salvaged if it is a monster. Only during your opponents Main Phase can you activate this effect, but that only erases searchers from this cards reach. This is a great card for the archetype. The archetype likes to control using big monsters that can stun and force you to use cards, and this card does just that. This with Titanic Galaxy is a steep first turn board to go up against, and Photon Sanctuary makes this card, and that card is not a once per turn. You probably saw this coming, but to end this week, we have the new Link Monster for Galaxy/Photon so you don’t have to run the generic LIGHT Link Monster anymore, Galaxy-Eyes Solflare Dragon. Galaxy-Eyes Solflare Dragon is a Link-2 LIGHT Dragon with 2000 ATK, requires 2 LIGHT monsters including one with at least 2000 ATK, and has arrows pointing Bottom Left and Bottom Right. ATK is good on a Link-2, LIGHT and Dragon is a great combination, arrows are outstanding, and the requirements are easy to achieve in Galaxy/Photon as a whole. If this card is Link Summoned, you can target 1 Photon or Galaxy monster in your GY and add it back to your hand. Nice little recovery option to extend your plays. Maybe grab a Galaxy Soldier to go into a later Rank 5 play or get back Galaxy Knight to Normal Summon and use for a Rank 8 play, or just to have an option for next turn in general. During your opponent’s Main Phase (Quick Effect), you can discard 1 Photon and 1 Galaxy card or 1 Galaxy-Eyes Photon Dragon to target 1 Special Summoned monster your opponent controls and destroy it. A disruption option against your opponent on their turn is handy, though it is a 2 for 1 if you aren’t discarding Galaxy-Eyes Photon Dragon, but it makes sense that you can just discard Galaxy-Eyes Photon Dragon instead of a Photon and a Galaxy monster. Both effects are hard once per turns to balance this out a bit, but this is still an great Link Monster and worthy to be ran at 2 in the Extra Deck, I’d say 3 but the Extra Deck is so packed and Galaxy/Photon have access to many good Rank 8s you’d want to play, along with maybe having some good generic Link Monsters. Art: 4.5/5 Galaxy-Eyes now has the power of the Sun! Anyway, whether you did or not, Galaxy-Eyes Solarflare Dragon closes the week. This is a Link 2, Dragon, of the Light attribute (all good) with arrows pointing to the diagonal down on both sides. who requires two generic Light Monsters for a Link Summon, although one of them must have 2000 or more attack. At first thought, that might seem an odd requirement, but it fits the newer cards, and shouldn’t be too difficult. Oh, but wait, instead of giving up those two cards, you can specifically discard a Galaxy Eyes-Photon Dragon for the same destruction ability. GEPD does like being in the Graveyard, and there are a plethora of plays that can be made with him while he resides there. Each effect can only be used once per turn, but you can use each once a turn, instead of once of per turn. So that’s working in our favor. I like this a lot. It’s not the strongest at 2000 attack, but has destruction, dumps to the Graveyard, and its Link Arrows should help you as well. It doesn’t need to be a powerhouse on top of that. Art: 5/5 Maybe some of the red/orange/yellow from earlier this week comes from this card? The dragon is freaking awesomely beautiful.